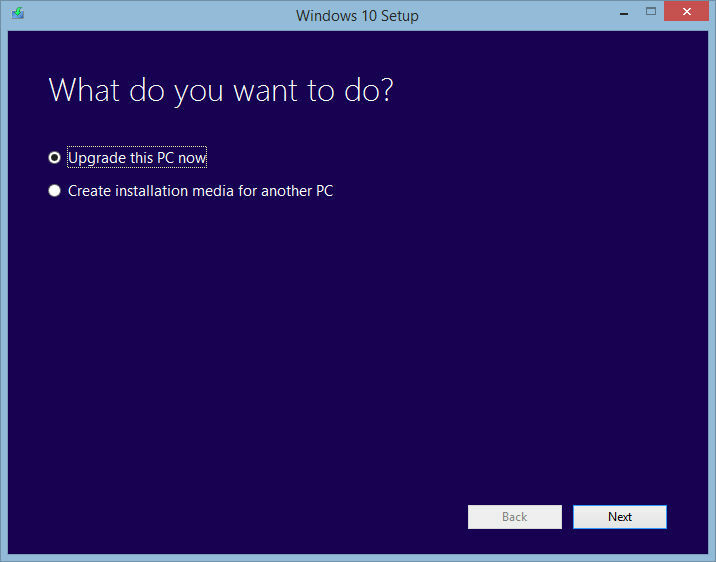 Back in November 2012 I blogged about installing the new Windows 8® on my laptop and the experience of the installation and getting used to the new operating system (often referred to as an “OS”). Here I am now blogging about doing the same thing with the new Windows 10®! Windows 10® was released to the unwashed hordes on 29 July 2015 with much media-generated fanfare, and it was (and still is, until 29 July 2016) FREE to anyone with a machine running an authenticated “genuine” (as opposed to pirated) copy of Windows 8.x® or 7®. Most of all, Windows 10® was going to be Microsoft’s tail-between-the-legs apologetic offering to the unwashed hordes to try to make amends for the largest business faux-pas since the Edsel (if you believed the media punditz); abandoning the START button. To be sure, Windows 8® was significantly different from Windows 7® – 8 was the first mass-produced OS designed to work with new-fangled touch-screen devices, AS WELL AS old-fangled mouse-and-keyboard machines. It was going to revolutionize the computer industry; the first OS that would run on all sorts of platforms – desktops, laptops, tablets, phones, touch-screen, non-touch-screen, keyboard- and mouse-based machines, point-and-swipe machines, all of them. But it left off the START button (insert wailing and gnashing of teeth here)!! The START button – as everyone in the known universe knows – was a button in the lower left of the computer screen (sometimes rectangular, sometimes round) that, when clicked on with a mouse pointer, popped up a sometimes cascading menu (cleverly called the START Menu) of programs that were installed on the computer and could be run by clicking on the program name and/or icon in the menu. It was first introduced with Windows 95® in August 1995. It should be noted here that while the START Menu was displayed, the user could do nothing else with the computer except navigate the START Menu or click on a single item in the menu to start that program running. Clicking anywhere OUTSIDE the START Menu caused the START Menu to immediately vanish. While the START Menu was on-screen the user could see what had been displayed previously (except for the stuff that was occluded by the START Menu), but the user couldn’t get to it or interact with it without causing the START Menu to vanish. But Windows 8® – the scourge of all Windows users everywhere (according to the media) – took that away… but not really!! The START Button (which started out rectangular in Windows 95®, changed to circular in Windows Vista®, and changed again to trapezoidal in Windows 8®) WAS STILL THERE, only instead of popping up a vertical cascading START Menu that occluded some of the desktop and vanished at the first click, it brought up a full-screen scrollable START Menu with square chicklet-like boxes for each program that was installed on the computer; same function, different look. The user had the configuration choice of two (sometimes three) box sizes, so youngsters with sharp young eyes could make the boxes tiny and get more of them on the screen at a time, while older people with bifocals could make the boxes bigger and easier to read. Windows 8® removed the START Button from the screen, but made use of the previously-ignored keyboard button that has a “Windows” logo on it that started appearing on keyboards about ten years ago. Pre-Windows 8®, pressing that keyboard button was yet another way to open the cascading START Menu. With the advent of Windows 8®, pressing that physical button with your finger (instead of clicking that virtual button with your mouse pointer) would cause the screen to switch to the full-screen START menu. HOWEVER… the media-fanned public outcry over the removal of the START button on the screen was so incessant that Microsoft brought the virtual START button back with the Windows 8.1® release/upgrade. But that wasn’t enough for the unwashed hordes. I too was confused and discombobulated by the lack of a START Button in Windows 8® – for about 20 seconds. It took me longer (about 2 minutes) to figure out where they had hidden the entry to the Control Panel! I can only conclude (and I have plentiful examples to back up my conclusion) that 99.44% of the computer-using public is violently allergic to change of any kind! Get over it folks! Windows 10® brings back the START Button (in the lower left where it evidently belongs, and shaped like a trapezoid like it did in Windows 8.1®), and it pops up the START Menu, occluding some (or most) of what was on the screen, just like everyone (except me) longed for! Oh, by the way, the START Menu looks more like a miniature version of the START Screen, with little chicklet boxes for each program, and users can arrange them to their liking and resize them to their liking, like they could with Windows 8.X® if they bothered to learn about it, but that seems to be okay now. The media-led choruses of Halleluiah (that the START Button is back) have been sung since the preview copies were released almost a year ago. I will never understand. Anyway, my upgrade to Windows 10® was done yesterday and was almost flawless, only a couple of minor hiccups. Microsoft had loaded a “reservation” tool on Windows 8.1® machines during a pre-July monthly update. The tool allowed the user to “reserve” their free copy of Windows 10® prior to the release date, with the reservation tool doing an authenticity check for the existing OS and a compatibility check against the system’s hardware and installed software before announcing that a copy “had been reserved” for this machine. It is projected that there are a billion and a half machines “in the wild” worldwide that qualify for a free copy of Windows 10®, so Microsoft staged the downloads so as not to bring their servers – and the entire internet – to it’s knees. I “reserved” my copy as soon as I saw the reservation tool on my machine. July 29th came and went; I guess I wasn’t going to be in the first wave. Just as well, as we were traveling in Montana on the 29th – I didn’t want to do the upgrade from a hotel room. Once we returned home I started getting impatient. I poked at the “reservation” tool every few days to see if anything had changed. 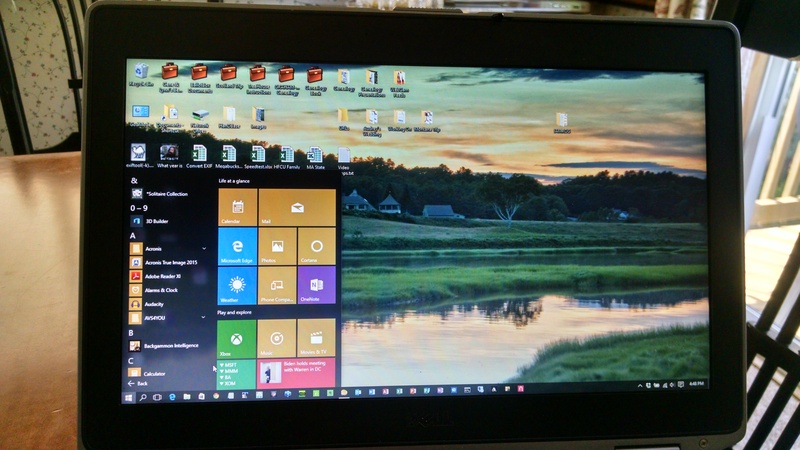 Mid-last-week I noticed what appeared to be a new link on the “reservation” tool’s screen – a “frequently asked questions” link – and the first question’s answer alluded to a downloadable “Media Creation Tool” that would let you do one of two things; download an installable copy of Windows 10® that would need a valid license before installing, or… kick off an immediate installation on a previously authenticated machine without waiting for Microsoft to decide it was “your turn.” You can guess which option I chose. Using my copy of Acronis True Image 2015, I cloned a copy of my laptop’s hard drive onto a spare laptop hard drive to preserve my machine in case there was a problem, then kicked off the upgrade! The upgrade took about 90 minutes, in twelve phases; Downloading Windows 10, Verifying Your Download, Creating Windows 10 Media, Getting Updates, Getting A Few Things Ready, License Terms, Getting Updates (again), Making Sure You’re Ready To Install, What Needs Your Attention, Ready To Install, Installing Windows 10, Upgrading Windows (yet a third time), and Login (I took screen snaps along the way). The What Needs Your Attention phase told me about the first hiccup – two problems I had. One I had to fix and the other I had to agree to. It told me my copy of Symantec Endpoint Protection (my virus scanning software) was incompatible with Windows 10® and had to be uninstalled, and it told me that my paid-for copy of Windows Media Center (*not* Windows Media Player) is not available in Windows 10. 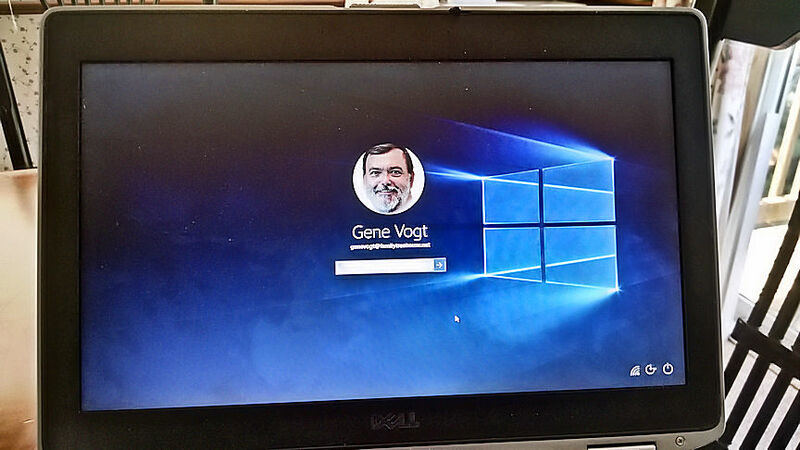 Once the installation finished I was presented with my new login screen, and my picture, username, and password were carried forward from Windows 8® to the new copy of Windows 10® – a good omen! Once I logged in, all my desktop icons were there, my desktop background images were in place and displayed, my apps were all there (except for Symantec Endpoint Protection and Windows Media Center, obviously), and they all seemed to be working! The last hiccup was familiar from my upgrade to Windows 8® from Windows 7® back in 2012 – my speakers were silent; no sound. Once I found the Control Panel (they moved it again) I checked all the sound-related device drivers; all were listed as functioning and up-to-date. I begged to differ. I popped over to the Dell web site (using the new browser, Windows Edge) and sure enough the hardware on this 5-year-old Latitude 6420 got misidentified again by Microsoft’s OS installation routines. I downloaded the correct drivers, installed them, and VOILA! Sound! And oh, by the way, this was the first time since I started down this road with my first personal computer over 30 years ago that a “whole-number” OS version upgrade (DOS2-to-DOS3, 95-to-“ME”, “Vista”-to-7, etc.) didn’t involve a wipe of the C drive, starting fresh and having to reinstall all my application programs all over again! Instead of a 2-3 DAY process, it took two hours, and I just watched! Dee-lightful! So I’m spending time finding old things (like the Control Panel) learning new things (like the multi-desktop feature and the new browser – I like them both!) and slowly rearranging the chicklets on the new/old/restored START Menu. I declare it a winner, but what do I know? I declared Windows 8® a winner!